With sole exception of Desmond’s solo shot, Hefner dominated the Nationals’ lineup. Hefner gave up four hits and one run over seven innings pitched. He threw 103 pitches, 67 for strikes, while walking a batter and striking out seven. Poor defensive decisions made by the Nats in the fifth inning nearly cost them the game. Mets outfielder Jordany Valdespin hit a single off of starting pitcher Jordan Zimmermann with one out before advancing to second base on a throwing error by Adam LaRoche. New York then took a one-run lead when shortstop Omar Quintanilla hit a two-run triple with two outs recorded. Neither of the runs scored were earned. Zimmermann threw another quality game despite not earning the win, which would have been his ninth so far this season. Zimmermann threw eight innings and gave up four hits and two unearned runs on 101 pitches, 71 for strikes. He walked one, struck out four, and hit one batter. Right-handed reliever Tyler Clippard picked up the win with one inning of work in the ninth. Washington’s lineup continues to struggle at the plate, even against teams like the Mets who are 11.5 games back in the National League East. 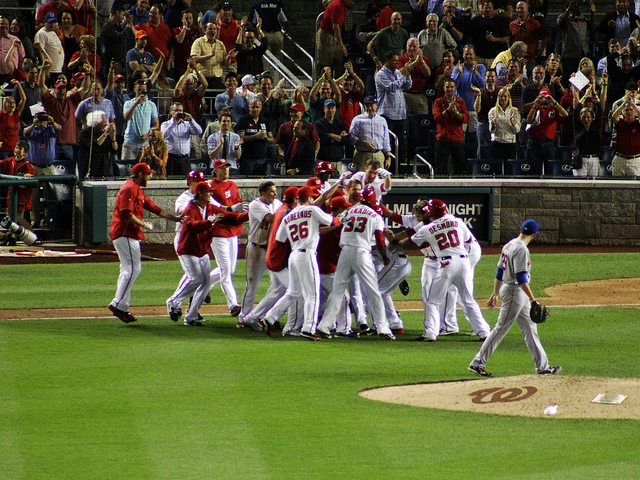 Before the Nats scored the go-ahead run and claimed their walk-off victory, a rally seemed impossible. Desmond’s early home run helped but wouldn’t win them the game. Outfielders Denard Span and Jayson Werth – in his first game back from the disabled list since May 2 – managed back-to-back singles in the sixth inning but the Nats didn’t score and stranded their runners. That trend continued throughout the game up until New York put right-handed relief pitcher Bobby Parnell in for the ninth inning. Third baseman Ryan Zimmerman led off with a double that crashed off the center field wall. Mets outfielder and ex-National Rick Ankiel almost caught Zimmerman at second base but couldn’t pull off the putout throw in time. Then, Zimmerman advanced to third base on a wild pitch during first baseman Adam LaRoche’s at-bat with no one out. LaRoche hit a RBI-single through the hole at second base bringing Zimmerman around to score and tying up the game at two runs apiece. The Mets then made the conscious decision to intentionally walk outfielder Roger Bernadina without a single out recorded. While that move didn’t make much sense at the time it ended up working out for the Nationals because with the bases loaded and Lombardozzi at the plate, a sacrifice fly was all Washington needed to win it and that’s exactly what they got.